Want it by Wednesday 24th April? Order within 10 hours, 56 minutes and choose Royal Mail 24 Hour Delivery at checkout. 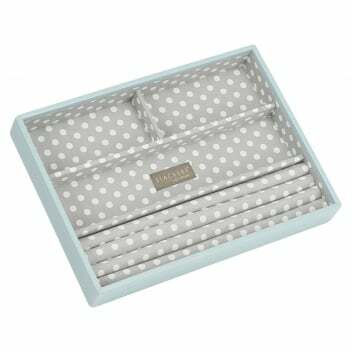 This beautiful stacker features a dreamy duck egg blue outer with a pretty polka dot lining and is ideal for holding bracelets, necklaces, earrings and rings. Place it under your duck egg blue lidded stacker for a pretty and practical jewellery storing solution.